Realms of Adventures follows the exploits of Adventurers who would uncover the lost bloodlines of their kindred heroes, and rebuild the innumerable Houses that once ruled the Realms... Choose now which House you'll serve! The Heraldric Shield you choose will represent your Character on the Encounter Map. Each House is important to the overall storyline. Selecting a House unlocks specific plots, objectives, and side quests for your Character to explore. Note: The heraldry shields in use at this time were created by Nathan Mangion for his world, to compliment the City-Kingdoms of the Haréshk map. Please visit his blog and let him know what you think of his work! Aerelewen (air rel ahh win) Elf House - Little is known about this house. Draelin (dray ellen) Centaurs are long distance trekkers who've conquered everything from mountain passes, to harsh desert terrain. Their fortitude ensures long lasting strength in the harshest of elements. Gamwich (game which) are Halfling the fishermen living near ocean shores, river banks, lake shores and streams. Sevigolith (say vee go leth) Human House - Little is known about this house. Helica (hell i cah) Elf House - Little is known about this house. Farin (fair in) Dwarf House - Little is known about this house. Beinion (bay nee on) Elf House - Little is known about this house. Valeact (val eck t) Goliaths are of the woodlands, and old growth forests. They are primarily hunters and gatherers. The Albino Elk is viewed as their spiritual guide. Xarthos (zar those) Karura House - Little is known about this house. Poligar (pole eager) Centaurs are archers from the field, forest, glade, groves, rolling hills, and farm lands of the Realms. They will rarely be found in the mountains or along seashores unless in territorial conflict or adventuring. Pedrinnor (ped reen nor) Human House - Little is known about this house. Soderqvist (so derr qu ist) Dwarf House - Little is known about this house. Jevne (yev nee) Dwarf House - Little is known about this house. Habrision (Hay bree cee yon) Elf House - Little is known about this house. Matiz (maa tease) are the most noble of Mios bloodlines. They are involved heavily in the politics and religious orders of the Realms. Some, in the House, would say to a fault. Suston (suss ton) Minotaur House - Little is known about this house. Aelfum (ale fume) Minotaur House - Little is known about this house. Stoor (stow oar) Halflings find their home among the forests and wilderness that adorn the Realms. They share a symbiotic relationship with all woodland creatures, but revere the mythical and elusive Albino Elk above all others. Elemma (el ee mm ahh) Human House - Little is known about this house. Aelfric (ale fr ick) Karura House - Little is known about this house. Tysycieth (tea-sea-kith), the only Naga House known to exist. Legend holds states the bloodline began in ancient dragons which formed the world. Carthorp (car thorp) Human House - Little is known about this house. Thiressa (tear essa), a Human House of livestock breeders and drivers. Bloodlines of all domesticated animals in the Realms can be traced back to House Thiressa breeding. Aravi (ah rah vee) are nomadic desert dwelling Mios. However, they still adhere to the militaristic and highly cultured civilization of Mios society. Achcester (ack kes ter) Human House - Little is known about this house. Gers (gerz) dominate the far northern mountain ranges and wind swept, karst filled plains of the rugged borderlands. The stoic Mios have a difficult time with other Lionmen, but an even worse relationship with other races of the Realms. Ruina (rue ee na) Gnome House - Little is known about this house. Lothran (low th rain) Halfling House - Little is known about this house. Erael Bes (air all bess) are the 'sea horse' Centaurs found living along shorelines between barrier islands. They move between shore and isle frequently. This ensures the safety of their people, and enables commerce with other coastline races. Revion (raa vee on) Elf House - Little is known about this house. Sterfield (stir field) Human House - Little is known about this house. Morminadon (mor min ahh done) Karura House - Little is known about this house. Durere (derr rear ee) Dwarf House - Little is known about this house. Aeta (aa tah) Dwarf House - Little is known about this house. Hdeyn (hay den) Dwarf House - Little is known about this house. Norcott (nor cot) Human House - Little is known about this house. Os (eww ss) are the warriors, fighters, mercenaries, and soldiers of the Goliath peoples. Rhiraf (rear aa ph) Human House - Little is known about this house. Astae (ahh stay) are sea going Mios. They inhabit nautical towns and shipping centers throughout the known Realms. Ythoryn (eee thor in) are the most commonplace and prolific of all Mios. Found living in the forests, plains, and fields - as fighters, farmers, archers, mages, and priests. Seca (sea k aah) Karura House of warriors, but little else is known about this house. Lundsten (loon d sten) Dwarf House - Little is known about this house. Endvelm (end vel mm) Gnome House - Little is known about this house. Thaelin (thay lin) Karura House - Little is known about this house. Yara (yahh rr ahh) Elf House - Little is known about this house. Magons (maa gone ss) Dwarf House - Little is known about this house. Besharg (bee sh ark) take to the sea in ships of staggering dimension and ornate design. On shore, as guards of gigantic and majestic port cities they enjoy a lavish lifestyle, for a Goliath. Devacia (dee vaa shee a) Karura House - Little is known about this house. Lothliniel (Low th lin ee el) Elf House - Little is known about this house. 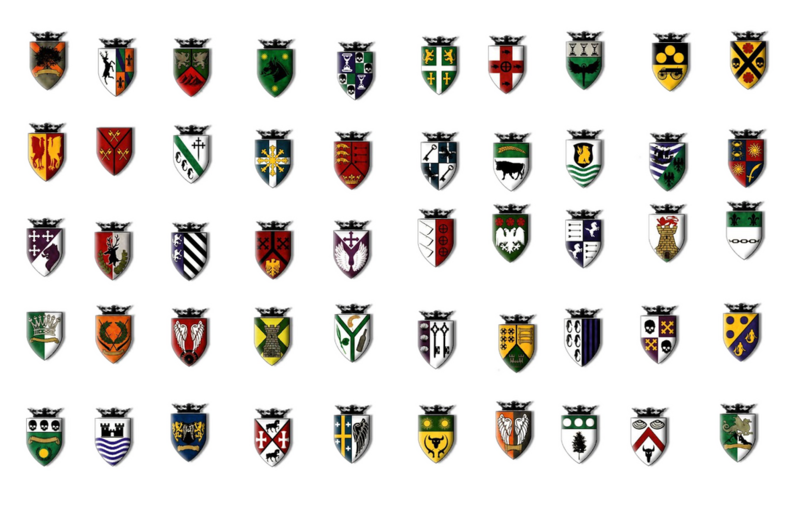 Suggest a House Name, History, and Heraldric Shield!